“In Belgium’s most recent election, 87% of the voting-age population turned out. In Turkey 84% voted and in South Korea it was 80%. But in the US, in 2012, just 54% of the voting-age population exercised their right to vote. That is one of the lowest turnouts in any developed country. In fact, this oft-cited statistic is much lazier than the Americans at whom it points the finger. Turnout is more complicated than that. If instead of looking at Americans over 18 that vote you consider the share of registered voters who show up on election day, the US jumps from 30th place among 34 developed countries to sixth. So Thailand’s Crown Prince Maha Vajiralongkorn is flying back to Germany today. Of course no one dares to say this directly – here is Reuters – a onec reputable news agency: The Crown Prince “will fly overseas on Friday night and return home next month” said the news agency. I wonder where the CP thinks home really is given the amount of time that he and his family spend in Germany. Apparently the crown prince has told all Thai media to stop writing about the royal succession. He doesn’t want his behaviour to be discussed in public. Which explains the silence from Thailand. Emirates will phase out its remaining A330-200s and A340-300s by the end of this month. Schedule data indicates Emirates’ last scheduled A330 service is provisionally set for Thiruvananthapuram-Dubai on Saturday, October 29 while the A340’s last regular service has been provisionally set for October 30 from Muscat to Dubai. The carrier’s fleet of three remaining B777-200(ER)s has also been scheduled for retirement at month end with its last regular service set for October 29 between Ahmedabad and Dubai. Once retired, Emirates mainline passenger fleet will constitute eighty-five A380-800s, ten B777-200(LR)s, ten B777-300s and 124 B777-300(ER)s.
It is no small irony that Thomson Reuters Corp is now expanding in Toronto just 28 years after Reuters acquisition of IP Sharp Associates – a deal sealed in a handshake in the restaurant at the top of the CN Tower. TR says that it plans to create a new technology center in Toronto by hiring 400 people over the next two years, and that its chief executive and chief financial officer will move to the Canadian city in 2017. Additional management roles will be relocated and recruited locally in Toronto over the next few years, Thomson Reuters said in a statement a couple of weeks ago. Cough, cough. That opportunity was almost thirty years ago! Our eighth anniversary today. Forever with you. I just knew. Still do. Nice lunch at Vivaldi in the Sheraton Creek hotel. One less than good idea from the Thai crew at Emirates. There is a petition being signed that ask EK to allow the Thai crew to wear a black ribbon in memory of the Thai King. Many Thais are doing this back home – and/or wearing black but this is not Thailand – it is the UAE and EK is not a Thai airline. What precedent do you set – what happens when the next monarch or VIP dies. What if a crew member does not want to wear a ribbon – grief and sadness are private, personal matters which many people prefer not to share. Will that happen to Thai crew who do not wear a black ribbon? Do they get harassed by their colleagues? What about on flights with Thai passengers – what happens when a Thai passenger protests that one of the Thai crew is not wearing a ribbon while others are? Bad idea which I hope Emirate have the good sense to politely say no to. Some of the abuse that has been posted on social media to and about my old colleague Andrew MacGregor Marshall has been vile and threatening. Open minds are needed. Disagree with him. Argue with his views. But the abuse is shameful. There is also a campaign to protest the BBC’s coverage of the late King’s death. Most of that coverage has been thoughtful and respectful. Yes there is some debate about the succession but so there should be in these unusual circumstances. Many Thais are, sadly, angry at something they have not even watched let alone given careful consideration to. The government and internet providers are fuelling this by establishing online vigilante groups. We were at the Thai consul in Dubai at lunchtime to sign the condolences book – with Apple, Nina, Brandan and Indy. Trump v Clinton. From a long distance what has been lost in the US presidential campaign is any adult discussion of the issues facing America and that America faces internationally; together with a real debate of policies/solutions. The debate has been lost behind the smear campaigns and allegations. A nation of such prodigious talent and creativity really should be better and offer better than this. King Bhumibol of Thailand died yesterday at the age of 88. 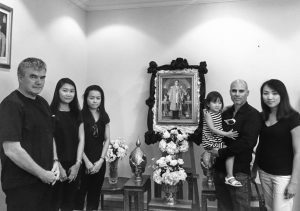 Since no discussion of the King’s health was allowed in Thailand his passing while not a surprise has caused deep grief and sadness across all of Thai society. There are obituaries and comments on other pages of this web site. “All of them – the students, the endless victims of the sad, sorry mess that is Thailand now, the victims of pointless coups and counter-coups, and shirts of many colours, political prisoners, and children sold into prostitution – they are all someone’s child, or brother or sister or parent. From 15 December 2016 Emirates will fly from Dubai – Ft. Lauderdale, becoming the first Middle Eastern carrier serving Ft. Lauderdale. From 15DEC16, A Boeing 777-200LR will operate this route on daily basis. In Tokyo after a few days exploring central Japan….Takayama, Matsumoto and down to Kawaguchiko by Mount Fuji. Such a nice change to be out of the big cities and to see some of rural Japan. Small, proud towns. Donald a Trump is imploding after the Washington Post published a 2005 video of Trump basically being Trump…obscene, offensive, entitled, abusive. Republicans are fleeing from him in droves; many demanding his withdrawal. The election is in a month. Where was that outrage at his comments on Mexicans, Muslims or his abuse of a war veteran’s family. Its like the GOP just woke up. Idiots. Happy birthday to my baby brother. Heading to Osaka today. I liked Hiroshima very much. The USA won the Ryder Cup. And did so with relative ease 17-11. Being 4-0 up after the Thursday morning foursomes was a huge start…the Europeans were always playing catch up after that. I have not watched any of the golf. And I did not miss it. Some of the fan behaviour was pretty grim. Your entry fee entitles you to watch the sport not hurl vitriol at the players, especially in golf.